As you can imagine, the thing keeping us the busiest is the fact that we are 35 weeks pregnant! Yesterday I went to the gym to walk on the indoor track and a random guy said, "When are you due? You've totally dropped and I think you're going to have your baby in a week". That being said, so many people keep telling me they think I've dropped and going to have him any day now which means we are getting last minute things in place and almost ready to go! Hospital bags are for the most part packed, Jon is going to pack his this week and with the exception of toiletries (which I will grab when we leave the house), me and baby are packed. We even have a bag of granola bars and snacks to bring with us. We are almost done with his nursery... we planned on doing a reclaimed wood piece on the blank wall over his crib but after thinking about the safety aspect, we are just going to do a big circular monogram painted on the wall like this one. Sorry folks but you won't see it until after he is born ;). We actually have a lot of monogrammed things in his nursery but they are hidden for when people come over. Can't wait to share! 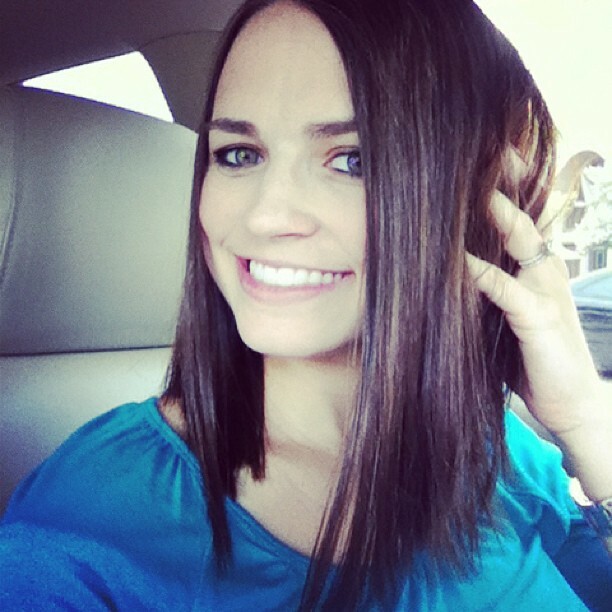 I chopped off my hair...which I hear is normal during the end of your pregnancy. I literally decided I wanted it cut and went to TGF on my lunchbreak for a $14 haircut and I love it! 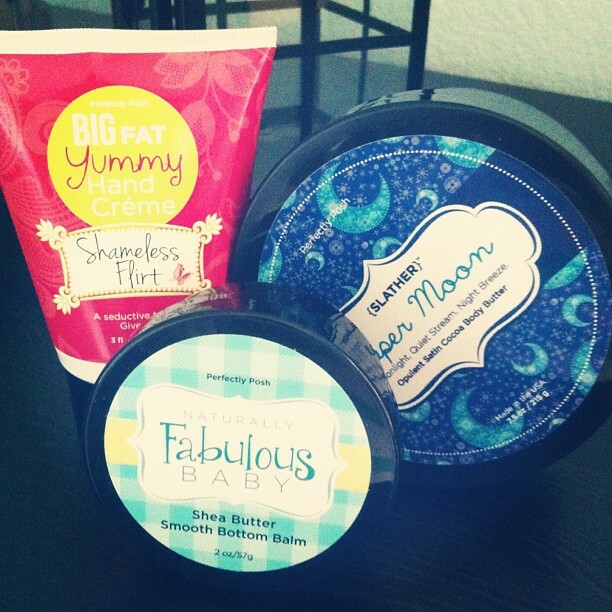 Tiffany sent me a big box of Perfectly Posh goodies and I have been LOVING the coco butter! I've been using traditional coco butter on my belly since the beginning of my pregnancy and this one is all natural and smells different and yummy. I can't wait to use the bottom butter on baby Hart's booty! It is organic and Vegan! 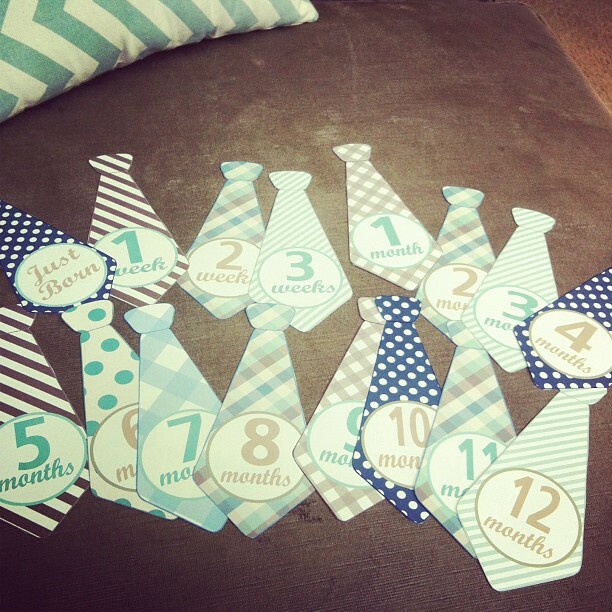 My little sister, Tomi, got us these adorable monthly stickers for baby. I love how they have them for the first few weeks in addition to each month. She got them from Baby and Belly Designs on Etsy. I've been strategically making dinners that I can double and freeze for after baby is born. We have 4 meals frozen already and I plan on making a few more over the next week. I figured I won't be cooking much when I hit 37 weeks plus so I am prepping now. Speaking of tomorrow, the whole family is in town so we will be BBQing/swimming/hanging at my parents. We went to a 4th of July party on Sunday and the fireworks got cancelled because a firework warehouse near Austin caught on fire. Anyone hear about that? Bummer! Our neighborhood's golf club always puts on a good show so I hope they can still do that tomorrow. We are going to a wedding of one my dearest friends from childhood on Saturday and I am really excited! Jamie sang during our ceremony and I can't wait to see her walk down the aisle. I keep telling baby he can come anytime after Saturday because I don't want to miss it. We also have a wedding on September 1st for one of my high school friends and I can't wait to introduce baby Hart to people! We've gotten into a nightly routine...projects/chores/random, dinner, showers, and we end playing marbles and having our own Louis Armstrong concerts at home. I have loved every minute of the past few weeks spending time relaxing with Jon, I still can't believe we will be parents so soon. I am in tears in .5 seconds after thinking about Jon holding our baby. Lots of boys to love in our house! Does anyone have an easy DIY tutorial for pacifier clips? I've seen some on Pinterest but would love a rec if you actually made them. Have a great holiday tomorrow! Month by month Ties!!!! Omgosh, that's the cutest thing I've ever seen! Baby boy is going to look so cute in those! 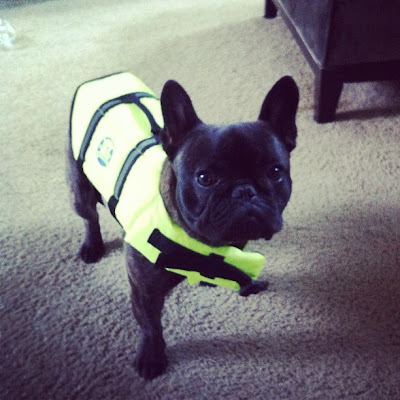 We have a life jacket like that for our dog and LOVE it! We go to the river a lot and it makes me feel so much better! Enjoy! Can't wait to the room, but most of all the CUTE little baby!! We want to get our pup a life jacket! Loved reading this update. Sounds like you guys are more than prepared and will be all ready when baby boy comes! That's fabulous! I so want to get my dog a life jacket. Ernie looks adorable in it. I hope you guys have an amazing fourth!! We are spending it with all my family and will just be grilling, swimming, and playing games. We are also a big game loving family so I love to hear about all the games you and your husband play! You are too adorable!! I did a ton of freezer meal cooking last weekend and let me tell you it feels great to be stocked so that once our bundle arrives there can be less cooking & more baby snuggling! AH! How exciting! I can't wait to "meet" sweet little baby Hart. It sounds like you have things really prepared and you're ready for him! That is so sweet that you're getting all those gifts, what great family and friends you have! Can't wait for you!! WOW!! 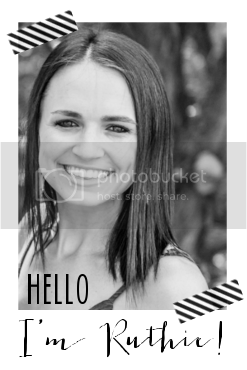 You are so organized with getting meals done, I never thought of that, even after baby number 3!! But since you are trying to be prepared and are doing amazing already, I would also suggest making some for the first 2 or 3 days after baby is born. I can attest after having 3 babies, that those days are thee hardest time to be organized with meals because of the lack of sleep! Even the hubby is tired from helping too! We were lucky and had meals brought to us from women in our church the first few days, and let me tell ya, IT HELPED!! It was thee best thing, except getting that meal once in awhile that wasn't your favorite. But we still appreciated it. Hope you have a fun 4th!! 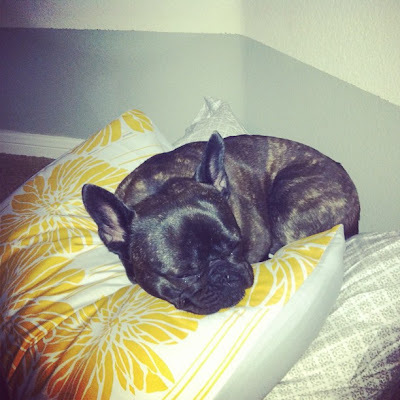 And your pup is seriously too cute!! I love how you are so organized Ruthie!! Do you mind sharing what you packed in your hospital bag? Thanks!! my dogs would not tolerate a life jacket. it would be ripped to shreds in seconds. rusty however really likes bow ties, he walks around and shows it off because he knows he is fancy. im dying to cut my hair too!!! waaaah!! i can not wait to see his nursery!!! there are little initial pieces in ours too that i always have to hide ;) sneaky mommas we are! not much longer tho! You are getting so close!! Those are totally the stickers I am planning on getting too, or at least something similar! He's almost here! I can only imagine the emotions you are experiencing right now...it must all be so amazing!